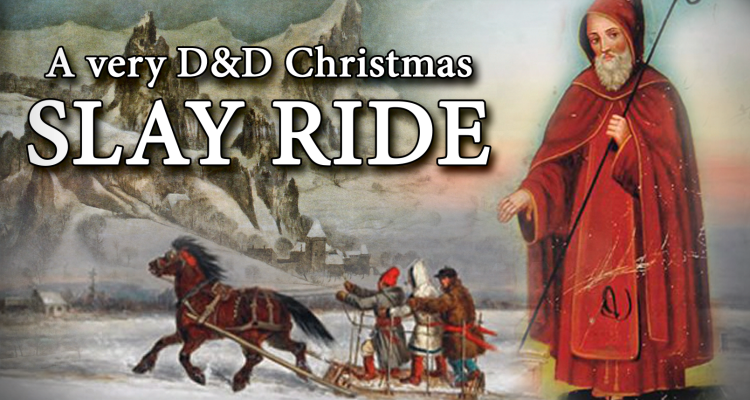 If among shopping, traveling, and decorating, you somehow found time to DM a single game of Dungeons & Dragons in December, let us inspire you with a holiday themed campaign idea! 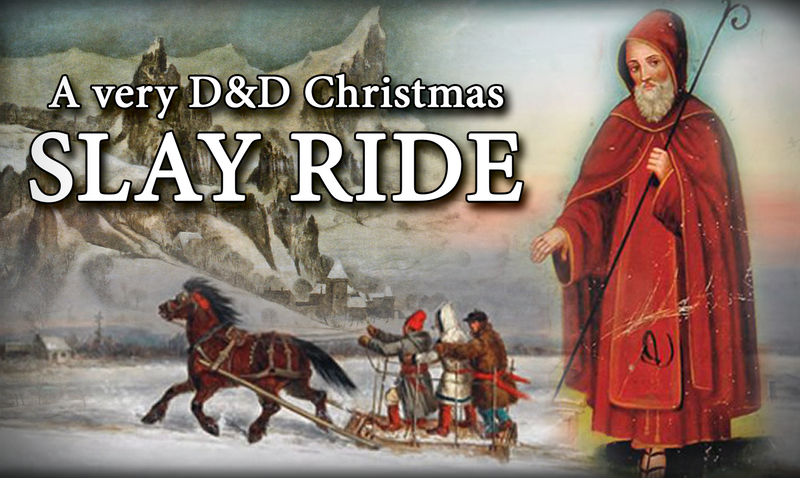 You’ll probably want to keep the fact that this is a holiday themed campaign a secret, so try to treat it like a normal adventure for as long as possible. 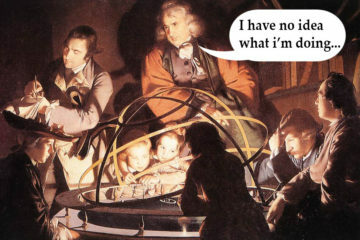 Hopefully, when your players put the pieces together, everyone will have a good laugh. If you sense that they’re catching on early, don’t be afraid to up the holiday themes by a few hundred percent! A local NPC has fallen on bad fortune as of late: all of her inventory has spoiled and her wares have broken. She suspects sabotage, but when more people start to inexplicably have similar problems, it becomes clear that the town may be under a curse. The only lead the players are given is from the town historian, whose house and collection of town relics were recently burgled. They suspect the break-in to be the latest in a string of crimes and attacks committed by ‘the Blood Wizard’, who has been harassing the town after being kicked out for killing a local and beloved saint. The adventure begins with the players outside of town, in the wilds. A nearby elven tribe may know the Blood Wizard’s whereabouts, but when the players arrive, the village is being pillaged, and the elves have been captured by frost elementals and yetis –despite being miles from snowy lands. If the players can save any of the elves, they will disclose that the wizard was here, and that he commanded the elementals and yetis with mind controlling magic. The trail is still hot –or cold, rather, but only if they follow the creatures quickly! Tracking the steps to the snowy fields of the “Pale North”, the wizard’s lair becomes clearly visible — a structure lit by bright magical fire. The walls are guarded by more frost elementals and yetis. Once the players penetrate the outer wall, they face twisted elves and wargs with gnarly stag horns. Inside the keep they face traps, such as poisoned red and white hooked darts (candy canes). They’ll find the Blood Wizard himself, guarding what appears to be a scroll, and riding a warg with a flaming nose, whom he calls “Wardoff.” The encounter could take place entirely in his throne room, or it could continue in a chase sequence; the wizard on his steed, the players on a magic sleigh behind him. Take it to the skies if you wish! When the players get the scroll, they see it’s entitled “The Naughty List”. If one’s name or family name is scrawled upon it, they will fall upon bad fortune. The Blood Wizard -who shouldn’t die in the encounter- is now known to be repelled by lights, candles, and lanterns, as well as allergic to pine trees. Several days after the adventure, the town is covered in candles, and every house has a pine tree. The Blood Wizard swears to return in one year to take back what is his, and to exact his revenge on the players. >The Fleece of Navidad: A jacket made of fleece, gives a +1 to Diplomacy, you also speak an additional language, determined by when it was crafted. > The Jingle Balde: +1 Short Sword that deals an extra 1d6 weapon damage when you make an attack while hidden, the blade then jingles loudly for 1 hour. The bells can clearly be heard by all creatures within 50 feet. >The Bow of Missletoe: A +1 Shortbow. When you score a critical hit with this weapon, it immediately casts magic missile. We do not claim these items to be balanced, they are for novelty purposes only! So, there you go! Let us know some of your own holiday themed campaign ideas!